I organize my campaign like writing a novel. A good campaign has so many places, people, and themes, that it can get overwhelming to keep up with it all. I plan on doing some videos in the future showing a lot more, but I wanted to make a quick overview of how I compose a sheet for tracking NPCs. I have tried many campaign trackers over the years, and while each had good points, I have found Google Drive to be the best. I can access it from all my devices, and at any time, which makes it ideal when that idea hits me during lunch, or right before bed. For NPCs I have made a template that I copy and paste into a new google doc. This was heavily borrowed from Scribus, a program used for organizing novels. I tried to use it for a while, but found the interface clunky and a lack of online cloud support was a deal breaker. 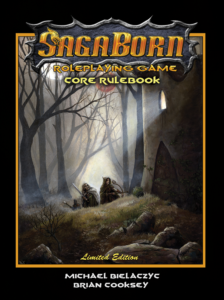 For the character sheet, I use PCGen which has the SagaBorn ruleset built in. I make a character in the generator, then export as a txt file and copy that into the google doc. for an example of what my sheets look like you can check the image below or head over to the Dark Return website to check out Mort’s sheet. Mort’s Character Sheet over at the Dark Return Website. I will share sheets with my players for NPC’s they interact with a lot, but keep my GM notes separate. All NPCs are kept in my NPC folder in the campaign organizer folder, but they are also easily found through google drive’s robust search engine. It seems pretty simple, but this has made NPC tracking so much simpler for me and I hope it helps you as well.